At the start of the 80s the necktie had just come out of the kipper tie era of the 70s. It was difficult to know what to do with it. This selection from the early 80s (right) shows a liking for browns. 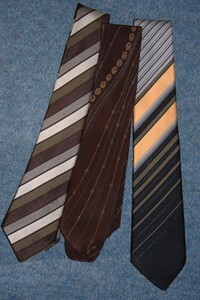 The silk tie (centre) is more expensive and shows a flowing pattern. The other two are very similar to designs sold in the 70s, except that they are a little slimmer than the kipper tie extremes of the 70s. The black, grey and yellow tie is still wider than the standard 3 inches. It was possible in the early 80s to get your old kipper ties resized to fit in with the new fashion. For the youth market, the skinny tie made an appearance at the end of the 70s. Inspired by the Punk and New Wave rejection of the hippy derived flares and kipper tie look, the slim tie was highly fashionable. A daring 2 inch width was a huge change from the kipper tie of the 70s. It took a while for the slim tie to filter into mainstream men's fashion and even into conventional youth fashion. This collection, left, shows three fashion ties from the early 80s and a rather more upmarket silk paisley tie from around 1986. The black tie with squiggles, far left, is by 'Fiz', the mauve tie is by Avanti a brand name of C&A and the silk paisley is an Italian design sold by Tie Rack. 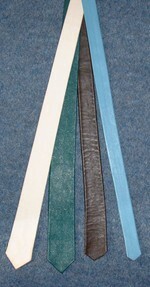 Ties in unusual materials, such as leather or suede, enjoyed a brief spell of popularity from around 1983. This itself was a revival of a style first tried in the sixties. These ties took the skinny tie to ludicrous extremes. The pale blue tie is the same width at both ends, less than one inch. Worn by men such as Boycie from 'Only Fools and Horses' this was the aspirational look for the 80s. White combined with blue and yellow was a favourite. 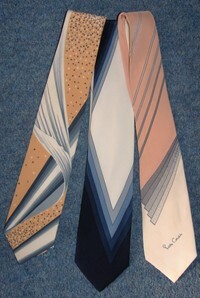 The two ties on the far left are by Jos� Piscador and the one on the right of the group is by Pierre Cardin. Being the 80s it was perfectly acceptable to show the designer's name on the tie. These silk ties were expensive and you wanted everyone to know that you were happy to splash out around �15 on a tie. These ties were a very conventional 3 inch width. The style was in the pattern rather than the proportion. They are well made in expensive silk which set them apart from polyester used in most ties from the 50s onwards. 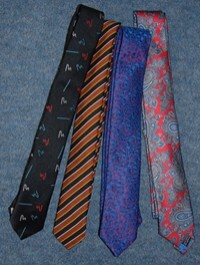 There is a great selection of vintage ties on eBay. Most sell from around £5 to £15.